Yvonne is the Senior Manager for Corporate Resources and Programs at Points of Light Corporate Institute. Points of Light is the largest non-profit in the world dedicated to volunteer service. Their corporate institute is the “go-to” resource for corporations to build strategic employee volunteer programs. She manages the learning programs and creates strategies, trainings, and toolkits to build successful volunteer programs. Yvonne highlights that she may do lots of different activities in one day but her focus is to help businesses understand their CSR roles, and how they impact the social and environmental world. Today, Yvonne works on many resources and trainings that are targeted to large Fortune 500 companies. These companies employ thousands of people, and are powerful and capable of real change and impact if their CSR and volunteer efforts are successful and sustainable. Yvonne also discussed her previous roles in engaging small businesses in nation wide campaigns and helping them connect to resources and other companies to get inspired. She surprisingly finds that most of the cutting edge work in CSR and civic and social impact is coming from smaller businesses! Yvonne also talked about job trends and necessary skills for this field. This was significant. How do we align every day with volunteer trends and social good? Ultimately, most people are looking for the kind of work that means something, whether that be met through volunteerism, or through the mission and practices of the business. 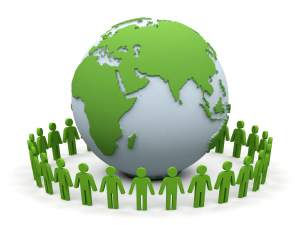 the CSR role that businesses have globally and in communities is huge and trending. People want opportunities to give back. As social workers, we understand that. That is likely a large reason why we went into the field of social work to begin with. Yvonne shared the hard and soft skills that she has developed which set her up to do the work she is doing now. Hard skills include project management, writing, research, and communication (communicate best practices in a concise way and communicate with many different types of people). Soft skills include flexibility, communicating across culture and time zones, navigating team dynamics, being comfortable with ambiguity, and paying attention to detail while having the larger picture in mind. Many of these soft skills are highlighted in a recent video by HBX- Ernest Wilson, dean of the Annenberg School of Communications & Journalism at the University of Southern California, discusses the top skills needed for the future, skills that social workers naturally possess and develop in their education and experience. To be honest, this is one of the most simple, but most motivating pieces of advice I’ve heard so far. Push yourself, challenge yourself! Easier said than done? I have three suggestions that I’ve been pushing myself to try that have resulted in motivation and confidence. 1. My first suggestion is related to self awareness. Do you truly know the qualities you possess? Are you comfortable expressing and talking about them? This doesn’t include vague, impersonal skills or qualities like “hard worker” or “nice”. This includes real, personal qualities. What makes you, you?! What do you bring to the table? How do you work best? Amongst many other self-awareness and personality assessments, I have tried Gallup’s Strengths-Finder. This is a great took to get to know yourself better, and to become more aware of how your qualities apply and translate into your everyday life and future goals. 2. Next, add these discovered skills, qualifications, and keywords to your resume, or at least be ready to talk about them. Do you have anything related to these qualities on your resume? How can you talk about your experience and sell yourself using this new knowledge? 3. Finally, my third take-away is (this may sounds familiar)…network! Yvonne shared how many of her clients can learn from other companies that are doing well. You look at other companies and find out how they are successful and then take their strategies! This can be applied to networking as well. You can learn fro other people that are in positions in which you could see yourself one day. Reach out and find out how they got there. Get inspired and “connect the dots”! What conferences and workshops can you attend in your area? Yvonne discusses many different conferences and training sessions during her conversation. Do a Google search! Remember you’re on your own path and there’s no clear, or right, direction. You won’t be given anything, you need to search for it! So, how do you define your own success? What qualities do you possess that can help you market yourself to potential employers? Feel free to share your ideas in the comments section below. If you haven’t had a chance to watch Yvonne’s entire Career Series Session, I encourage you to take a peek. Her words will surely inspire you to become more self aware and to challenge you to become familiar with your the professional qualities you posses.